Basketball play-by-play isn’t rocket science. Broadcasting the sport is often easier than playing it. With these seven simple tips, providing all-star caliber basketball play-by-play will be even easier. New listeners don’t want to wait. Give it at least every 90 seconds. Pick an end of the floor and give the time and score every time the ball goes to that end. Where exactly is the ball? It isn’t enough to say “Smith on the perimeter.” Instead, tell me, “Smith on the left wing or 15 feet out on the left baseline.” Use the markings on the court as reference points. You know the free throw line is 15 feet from the bucket and the three-point line is roughly 20 feet out (in high school and college). It’s always surprising to me how often folks fail to even tell me if the ball is on the left or the right side of the hoop. This includes relevant action, movements, behaviors, sights, sounds, smells & emotions of players, coaches, fans and atmosphere. If you take away nothing else from this blog, remember to tell your listener a story, and not provide them with only a simple narrative. This is the toughest component of basketball play-by-play to master because it comes only with experience. Still, if you are aware of it, you’ll expedite your development. Match your pacing to the speed of the action. Use inflections and pauses for emphasis and dramatic effect. Be appropriately energetic & excited but never scream. 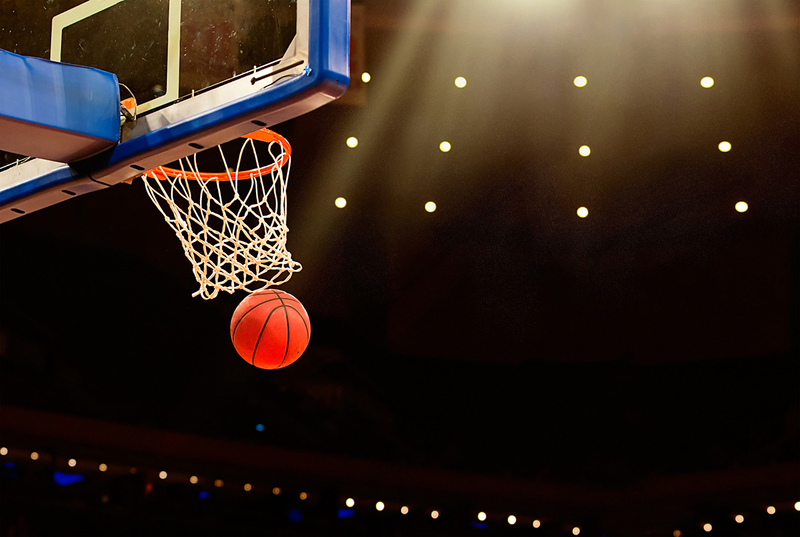 5 bonus basketball play-by-play tips to make you a star! 1. Be clear about which team has the ball. This is the most common mistake in basketball play-by-play. There are a lot of changes of possession in basketball. You can’t count on all of your listeners knowing which team has it based only upon the names of the players. 2. Avoid saying “good” and “no good.” Be specific about missed shots. Vary your vocabulary. Instead of good, maybe say nails it, drains it, drills it, or swishes it home. Instead of “no good,” describe how the shot was missed – off the heel, too hard, rolls around and falls off, etc. 3. Don’t reference the shot clock when it is over 10 seconds. The exception is following a dead ball. However, be certain to reference the clock when it goes under 10 seconds. In other words, wait until it becomes relevant to your story. 4. Use mascot names minimally in your basketball play-by-play. There are a lot of Wildcats and Falcons out there, especially at the high school and small college levels. The majority of the time, when referring to a team, use the name of their city or school. Ex: Palisades leading Elsinore. 5. Use the one-ear headphone. In other words, cover only one ear with your headphones. Keep the other ear uncovered and you will hear a lot of info that will help your broadcast – things like the PA announcer saying which player was charged with a foul or coaches barking instruction to players. These are all easy-to-implement suggestions. Do it and see your basketball play-by-play take a big step forward! These suggestions are also outlined in the STAA Play-by-Play Pyramid. Download your copy here.